I want my touchpad to be disabled when I use my mouse. How can I do that? touchpad-indicator has stopped working on 11.10. It used to work on 11.04. Gnome3 is not a solution as I don't like it and find it buggy. Click off/on button to the right of touchpad settings. After this you will get a switch in your notification area. You can manually run it or run it on start. Then you can make the script run at boot. Instead of xinput, with id variables that can change, better use synclient as indicated in other answers, like this. To be used with launchers or shortcuts as said below. This is just the application of the commands in this answer under the present question. 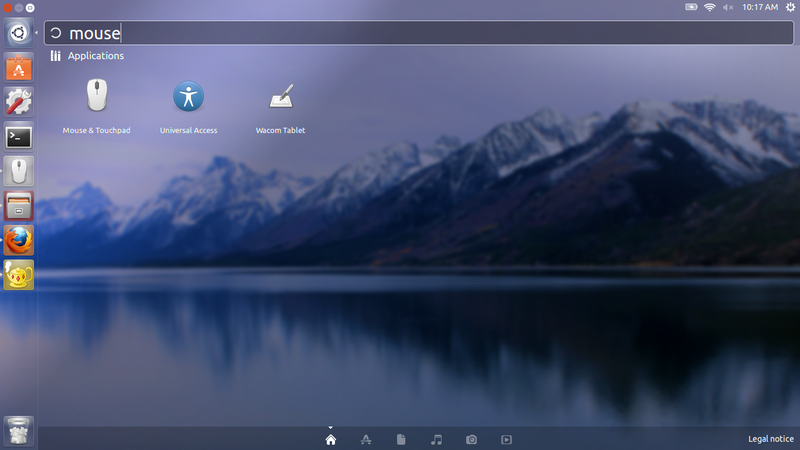 The solution below is limited to Xfce/Xubuntu, but although I made it by chance, I find it too elegant not too share it here. So, I created a separate question initially, just for Xubuntu. That question cannot but be a duplicate of this one and may be closed for this reason, that's why I dare to re-post that answer here. I use the following script to enable/disable touchpad. I also assigned it to the keyboard shortcut. if you run without arguments then it will simply invert the current state of he touchpad. echo "Unknown arg! Pass no args or on/off !" and I would put it in .bashrc or whatever except that I'm not sure that device 12 (actually 11 for me) is always the touchpad. Instead of remembering that command every time you wish to enable/disable the touchpad, you can instead add it as a keyboard combination shortcut. those are the off/on respectivly. Now that those are added, click on Enable Touchpad's Shortcut column (should say 'disabled') and type the keyboard shortcut you want it to be, I chose Win+1 (Hold Windows Key and press the number 1). Do the same for Disable Touchpad, I chose Win+2. Now Win+1 enables my touchpad and Win+2 disables it. In my case, fn+F9 is mapped into Touchpad toggle. But the key does nothing just showing touch pad icon on the right-top of the screen like this. Here is a solution for toggling touchpad just by pressing a shortcut. So I got a bash script file for toggling touchpad with 'xinput' command(original script can be found here). In my case, the id of touch pad was 12. 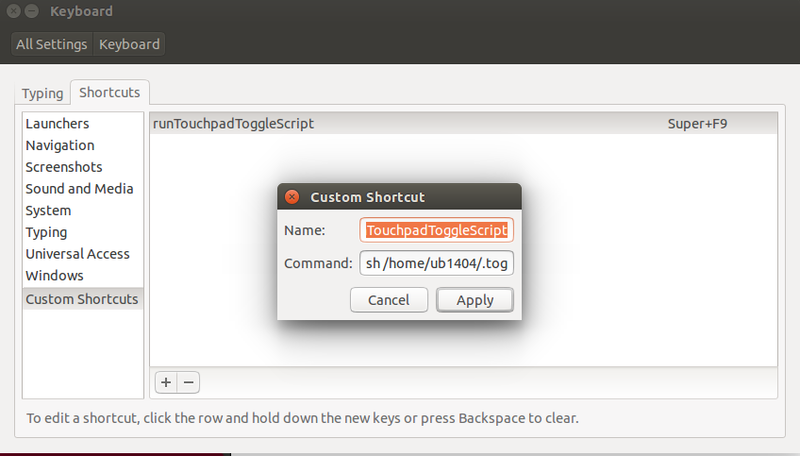 Save the above script file as .toggleTouchPad.sh at where you want. And last step is adding keyboard shortcut to run the script file. So just write sh /PATH/TO/SCRIPT in the Command of your shortcut window . Press the shortcut and check if touchpad is toggled. It worked at ASUS A556UA Laptop and Ubuntu14.04 x64 installed. so I had to assign another key(super+F9) rather than Touchpad toggle(fn+F9) key. It's a very tiny code which allows you to disable/enable the touchpad from terminal. install the Jupiter app. You can disable the touchpad with it and it is remembered. This has worked effectively for me on both a Lenovo IdeaPad and ThinkPad on 11.04, 11.10, and 12.04. 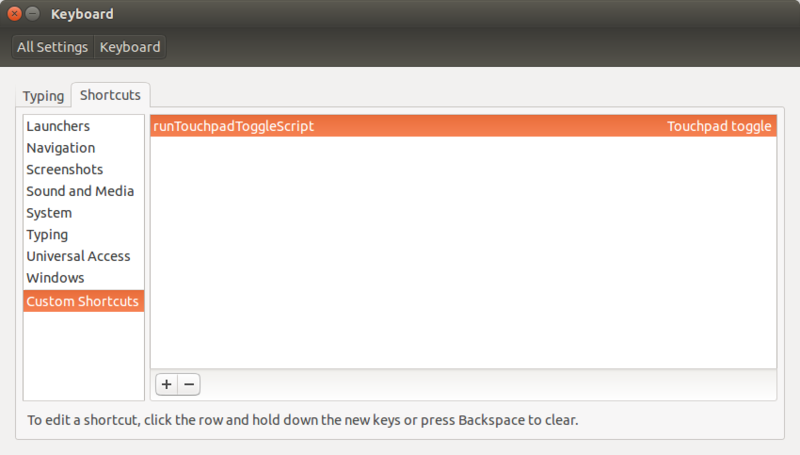 It is actually very simple to disable touchpad in Ubuntu. Just remove the package xserver-xorg-input-synaptics that is required for using touchpads in Ubuntu! I am using LXDE and I was not able to automatically disable the touchpad by adding these lines to ~/.config/lxsession/LXDE/autostart or /etc/xdg/lxsession/LXDE/autostart with a @-prefix. It was just ignored. And I tried disabling touchpad with dconf-editor (org.gnome.desktop.peripherals.touchpad) and gconf-editor (desktop.gnome.peripherals.TOUCHPADNAME), but both did not work. The settings on dconf-editor have no effect at all and on gconf-editor it keeps showing the error message "This key has no schema". I tried using the laptop function key (fn) to disable the pointer and it works. It did not work during my 11.04 days though, so give that a try. If your laptop keyboard doesn't have a touchpad on/off special-function key, maybe you can find an on-screen virtual keyboard that simulates it (although I haven't found one). TT=`xinput --list | grep -i touchpad | sed -e "
The touchpad is disabled if a mouse is detected, and enable if not. The touchpad id is found by the script. I have a Medion Akoya notebook model P7812 using Ubuntu 11.10 (64 bit) and the Fn & F6 key combination disables the touchpad. Alternative solution which works for all touchpads, no id needed. open a terminal and write "gedit toggle_touchpad.sh"
Save the file and exit. Now you have a file with the name "toggle_touchpad.sh"
Run the command chmod +x toggle_touchpad.sh to make the file executable. Place the file in any folder you like. Let us assume that you have it in the folder /home/username/myscripts/. From the menu on the top-right go to system-settings->keyboard->shortcuts->custom-shortcuts. Assign whatever keyboard shortcut you want. first use xinput list to get the base device name of your touchpad... than add the xinput disable command with the full device name (in double qoutes to accept the whitespace) to the ~/.bashrc file (ie xinput disable "SynPS/2 Synaptics TouchPad") the scripts above proved very hit or miss. This method works, but I can't seem to use the "win" button. So I used the CtrlF1 & F2 for it. Currently my laptop OS is ubuntu 14.04LTS. Oh, need to find out the xinput < id > with the command below. 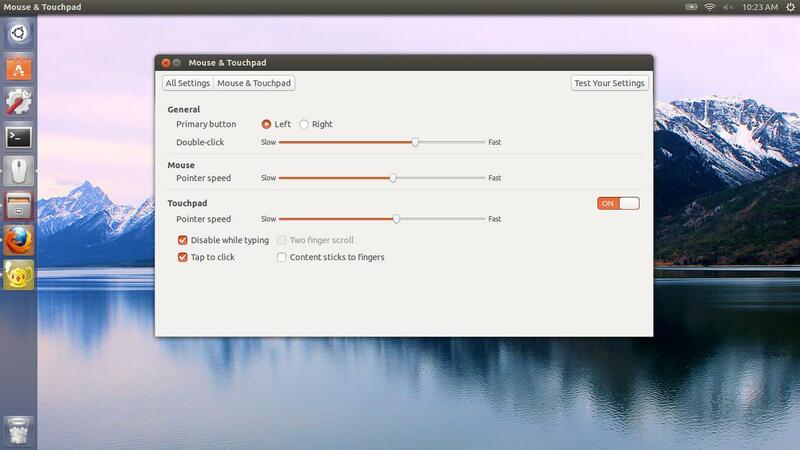 For Ubuntu 14.04, it is the "SynPS/2 Synaptics TouchPad"
I tried all the previous answers here without success. You may want to change the value 1 to 0.5. So, by combining Krzysztof Tomaszewski and JaeJun LEE's answers I came to this solution. Name it Toggle Touchpad, with Command /path/to/.toggleTouchPad.sh and whatever key combination you'd want (I've just chosen Super + F7). To disable my dell latitude's middle stick, I put this on .profile of Ubuntu so every-time I start/reboot my laptop, it will disable that input. In my case, with a Slimbook and Kubuntu, I just used the combination: Fn+Z. This disables or enables the touchpad. How to permanently disable touchpad in 12.04? How can we automatically disable Touchpad when Mouse is plugged in? How to disable the built in mouse pad in a laptop? How do I disable the touchpad in Ubuntu 17.10? How can I enable the touch-pad in 11.10 while I disabled it using touchpad-indicator in 11.04? How to disable touchpad while using trackpoint on a Thinkpad?